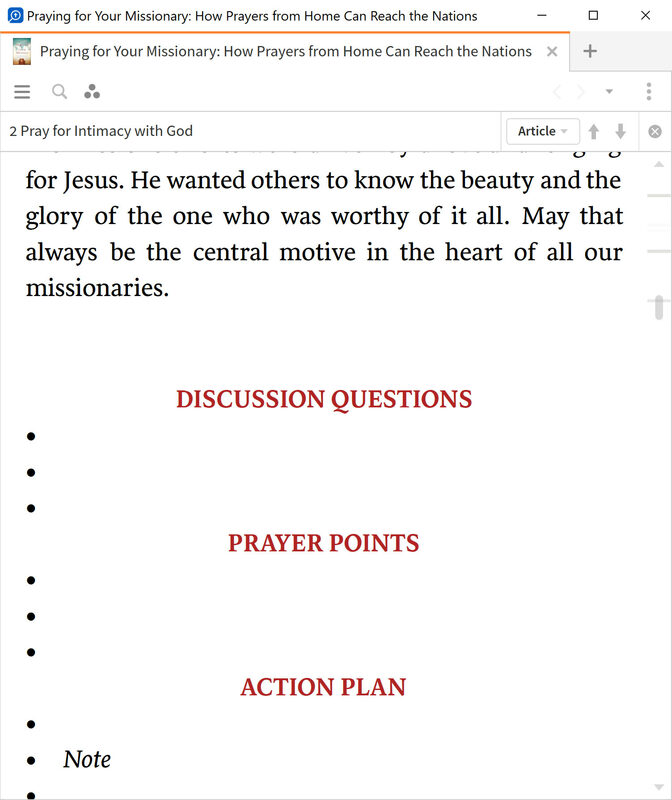 The book Praying for Your Missionary has several parts with bullet points. Most of those bullet points have no content. Can you give a screen shot with some context? Notice the bullet points? Some observations can be made about them, viz. Yes, I see! I don't own the resource, but I checked the Kindle "look inside" and there is clearly content which is not present for you. Could someone at FL take a look at this issue? I'm checking on it. Will get back to you soon. We put in a case with the dev team. They located the problem with the file and are going to work on correcting it. When it's complete your copy should be updated. Right now, there is no estimated timetable for completion, but I'm a watcher on the case and so when there is an update, I'll let you know. Thanks for your patience and continued support! The dev team just let me know that the file has been fixed and shipped to people who own the resource. Thanks for bringing it to your attention. Glad that we could get it fixed. Enjoy! The dev team just let me know that the file has been fixed and shipped to people who own the resource.